OxyContin is used to manage pain. More on OxyContin’s uses, side effects, how to identify problems with OxyContin here. OxyContin (controlled release oxycodone) is an opioid narcotic medication prescribed to manage pain. Is oxycodone an addictive drug? Yes. In fact, how OxyContin works puts you at risk of becoming addicted to oxycodone. 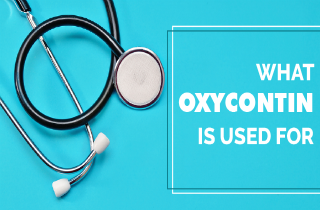 OxyContin’s main ingredient, oxycodone, works in a way similar to heroin by interacting with the opiate receptors of the central nervous system. So how can you identify and treat problems with OxyContin? More here on using OxyContin, as well as a section for your questions about OxyContin at the end. OxyContin is a prescription drug used to help treat moderate to severe pain. The oxycodone found in OxyContin alters the way the brain perceives pain and can help ease pain following surgery, an injury, or an illness. However, OxyContin can also cause intense feelings of well-being (euphoria) which often causes OxyContin to be abused. Always consult a doctor if you have any questions about OxyContin, and seek emergency medical treatment if your OxyContin prescription results in serious side effects. Even if you aren’t selling OxyContin to others, it is illegal to give OxyContin away to someone who is not prescribed OxyContin. This is because the extended release oxycodone contained in OxyContin can cause severe harm or death to others. The penalties associated with the abuse or illegal distribution of OxyContin vary by state or federal law. If you began taking OxyContin to help manage pain, and would like to stop taking OxyContin, speak to your doctor and ask about the best way to quit. A tapered dosing schedule can help you gradually reduce oxycodone in your system. After long-term use, OxyContin should never be stopped abruptly or without a doctor’s guidance. But how do you know if you have a real problem or possible addiction to OxyContin? OxyContin can get you high, and can therefore be misused. OxyContin should never be chewed, crushed, snorted, or injected because of the heightened risk of a drug overdose. Instead, OxyContin should only be taken in the amount and manner directed by your doctor. If you are not taking OxyContin as prescribed and either chew, inject or snort oxycodone, or are taking more OxyContin more frequently than prescribed, you may have a problem with OxyContin. In fact, it’s relatively easy to become addicted to OxyContin. OxyContin can cause strong cravings and drug-seeking behavior, the hallmark characteristic of drug addiction. If you’re addicted to OxyContin, there is help available. Do you still have a questions about using OxyContin? Please leave us your questions below. We will be happy to try to answer your question personally and promptly. Hi Sarah. Speak with the physician about this. I’m 19 years old and was prescribed 20 mg of OxyCotin twice a day for severe, chronic testicular pain. This pain was caused by a very bad sports’ injury. Anyway, I was wondering if OxyCotin is “Literally” continuously relief. Does it dispense the medication very slowly nonstop, or are there intervals in between? Basically curious about how this time-released mechanism works so I’ll have a better understanding of it. Thankfully it has brought down my pain dramatically (I’d be in the ER almost every night hooked to an IV). Also, are chronic pain patients less likely to become addicted to OxyCotin than people who abuse/misuse it recreationally? I’ll probably have to be on this medication for quite a while, unfortunately. Thank you! Hi Jonathan. 20mg of OxyContin time release are usually prescribed to be taken within 8-12 hour intervals. So, the dose of 20mg is released over a period of those hours. The point is to get a contact flow of OxyContin throughout the day, although it may take some time for the medications effects to start. I had been sick for 1 yr, with my doctor, thinking it was fibro. He put me on OxyContin, that of 40 mg x 2 with 15mg x5 daily for break thru pain. I was still very sick, the oxy would work, but, when the oxy wore off, the pain would come back. All of this happened in or around 2011. I was so sick, when my sister told me to ask him if I could have a Rhuematoid Arthritis lab work run, by then it was 2012. Oh my goodness! My test came back positive. My regular doctor, upped my OxyContin to 80 mg x2 daily and 30 mg oz condone 6x daily. Staring 2013, I started pain management, they lowered my oxcodone to 15 mg 5x daily and left my OxyContin at 80mg. They would also give me back injections on a monthly. I have been on those meds since 2011. I was put on Enbrial and has helped with my pain, but now I know my body has become dependent of it. I am trying to quit on my own, and have cut my dosage down, by cutting the doses in half, but now I see that it is not the correct thing to do. Should I discuss this with my primary Dr. I am so tired of almost falling asleep, during conversations, and at any given time. I have been on these horrible meds way to long, please help me. I need help, desperately. Hi Olga. I believe it’s best to address this issue with doctor’s help and guidance. Hi Lori. You can go cold turkey, but it’s not wise to do so for several reasons. It’s harder to quit smoking oxycontin than oral abuse. When you smoke, it hits faster and causes an overload of neurotransmitters-take it all away and it will cause severe withdrawal…and people usually relapse quickly. You can switch from smoking to taking the pills orally, then gradually lower doses over time, so you will eventually quit. You may also need some medical help during this period, so don’t hesitate to see your doctor if you feel the need. can you cold turkey off of smoking oxycontin or do you require medical ? I am really concerned about the oxycontin I take for pain. I have been depressed and have even cut down on the oxycodone, 10 mg 1-3 a day but only take 1-2. think I am in withdrawl. what can I do or how, safely? Hello Ivan. 10 years of regular dosing with OxyContin dosing makes the process of withdrawal perhaps more severe but not impossible! The first thing that you can do is to seek an individualized tapering schedule for you made by your doctor. Request that s/he take the time to map out a plan that will take at least 1-2 months to lower doses before you stop taking OxyContin completely. Then, if necessary, consider a medical detox clinic to supervise the final stages. They are experts at providing social and emotional support during withdrawal. I am sorry to hear of the loss of your wife. Support is certainly helpful when trying to get off opioid medications like OxyContin. Hello JO. It’s hard to say which medications are “good” or “bad” for an individual person. If your pain is relieved and you have a better quality of life, then the oxycodone might be good for you. Danger comes after years of taking oxycodone, during which time it can affect and damage your liver or other internal organs. Talk with your prescribing doctor about long term effects of oxycodone to understand more. I have had 4 back surgeries in the past 3 years, including a double lumbar infusion. The pain I have endured has been unbelievable. The doctor prescribed Oxycodone. I have been off and on solely as a result of pain from surgeries and physical rehab. I still can not drive and take pain medication. Is taking oxycodone dangerous for me? I hear so much bad news about it.